The top selling Quintrex 420 Busta open boat from Brisbane Yamaha has become a true Aussie icon. It is the ideal boat to work the Australian coastline where you can always find a river, bay, estuary or creek where you’ll find excellent fishing and crabbing. The driveaway package from Brisbane Yamaha comes with a 30hp two-stroke outboard with manual start which provides plenty of get up and go. It comes with a 24lt fuel tank and can add another for going further afield or there is space to add a battery if you choose to have an electric start option. The 420 Busta is rated to a maximum 40hp which would be better suited if you plan to load up the boat with people and gear. It is rated to a maximum of four people but for everyday fishing conditions with one or two adults the 30hp fits the bill. The huge interior of the 420 Busta is ideal for many uses. At 4.2m long the 420 Busta hull gives you plenty of options. You can go well upriver if you’re doing a bit of camping, local estuaries and even some of the more protected bays which are quite fishable out of a boat this size. You can purchase the boat as a straight open boat from Brisbane Yamaha, or you can add a few extras to it depending on your purpose. The Brisbane Yamaha team have put together a package designed for a young family or fishing couple that includes features such as an anchor well to keep the anchor stored and out of the way. Also included is a small casting platform with storage underneath for your safety gear and fishing tackle. It almost doubles your cockpit space as you still have large area for moving around the boat. The carpeted floor makes it more comfortable to fish for longer periods and side pockets are handy to access your fishing tools and to store you gear safely while underway. The package from Brisbane Yamaha features aluminium bench seats front and rear with flotation underneath. It makes good use of a small open boat with plenty of storage and lots of fishing room. The Quintrex 420 Busta is built on Quintrex’s Millennium Blade hull which features a flared bow which is designed to cut through the chop easily while flaring out the water which gives a smooth stable ride in tight turns with less spray. 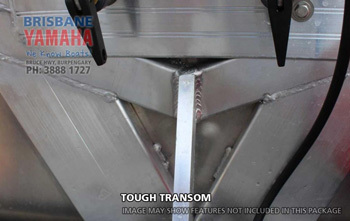 A super tough transom will never fail. Compare with other brands! The 420 Busta can also take rougher conditions with the 3mm aluminium transom designed for minimum flexing by the inclusion of supports built into the hull. It has twin aluminium box sections and a centre support to the keel. This ensures it can handle the rough conditions we sometimes find ourselves and makes the 420 Busta safe and durable. The Quintrex 420 Busta is the ideal first boat for families or those new to boating and the package from Brisbane Yamaha comes ready to head straight out on the water. 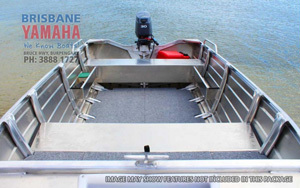 It features a transom step and rail for easy access in and out of the boat in addition to side and bow rails, while its carpeted low floor offers addition safety for kids out on the water. For more information on the Quintrex 420 Busta call the guys at Brisbane Yamaha and ask for a water test today, you won’t be disappointed, tel (07) 3888 1727.